Shortly after art school, they moved to London’s East End, then a bustling immigrant and working-class neighborhood, which has served as their home and studio for almost 50 years. Their changing neighborhood, which has become a gentrified creative center, has significantly influenced their work. The artists often appear in their work as witnesses to life unfolding in the sociopolitical and urban conditions of this area. Through imagery specific to London and the East End in particular, Gilbert & George create an ongoing portrait of the city that includes street signs, ginkgo trees, graffiti, postering, and gum-stained sidewalks. Gilbert & George received their BFAs at the Munich Academy of Art, Germany, and Oxford Art School, England, respectively and received their MFAs from Saint Martin’s School of Art in London. Recent solo exhibitions of their work have been organized at The Ludwig Museum of Contemporary Art, Budapest, Hungary (2017); Museum of Old and New Art, Tasmania, Australia (2016); The Museum of Modern Art, New York (2015); Nouveau Musée National de Monaco (2014); Diechtorhallen, Hamburg, Germany (2011); the Laznia Centre for Contemporary Art, Poland (2011) the Kröller-Müller Museum, the Netherlands (2010); the de Young museum, San Francisco (2008), Milwaukee Art Museum, Milwaukee (2008), the Brooklyn Museum, New York (2008); and Tate Modern, London (2007). Select group exhibitions featuring their work include The Royal Academy of Arts Summer Exhibition 2017, Royal Academy of Arts, London (2017); Take Me (I’m Yours), Jewish Museum, New York (2016); A Journey Through London Subculture: 1980s to Now, ICA London (2013); Regarding Warhol: Sixty Artists, Fifty Years, Metropolitan Museum of Art, New York (2012); ARTandPRESS, Martin-Gropius-Bau, Berlin (2012); The Original Copy: Photography of Sculpture 1839 to today, Kunsthaus Zurich (2011); BP British Art Displays 1500- 2009, Tate Britain, London (2009); and Passports: Great Early Buys from the British Council Collection, Whitechapel Gallery, London (2009). Their work is in numerous international public and private collections, including Art Institute of Chicago; Cleveland Museum of Art, OH; Guggenheim Museum Bilbao, Spain; Irish Museum of Modern Art, Dublin, Ireland; Istanbul Modern, Turkey; Magasin III, Stockholm, Sweden; Metropolitan Museum of Art, New York; Museum Ludwig, Cologne, Germany; Museum of Contemporary Art, Los Angeles; Museum of Contemporary Art, Sydney, Australia; The Museum of Modern Art, New York; Solomon R. Guggenheim Museum, New York; Stedelijk Museum Amsterdam, the Netherlands; and Tate Gallery, London. 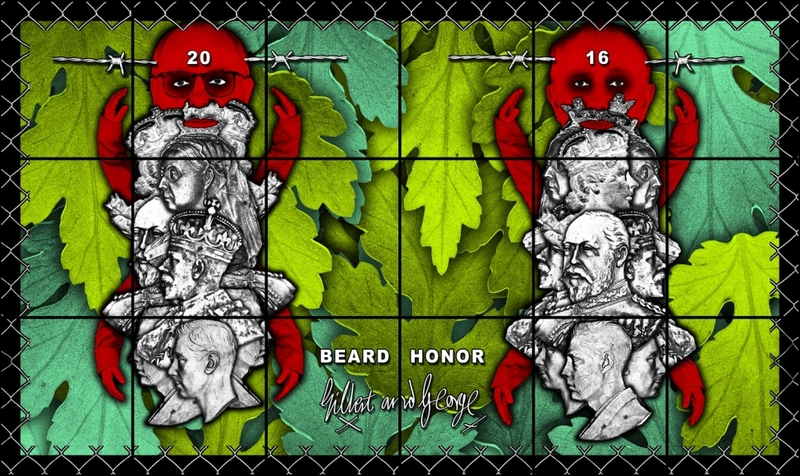 Gilbert & George have received honorary Doctorates of Art from Plymouth University, United Kingdom (2013); Open University, Buckinghamshire, United Kingdom (2012); University of East London (2010); and London Metropolitan University (2008). They have received numerous awards, including the South Bank Award, London, and The Lorenzo il Magnifico Award, Florence, in 2007; the Special International Award, Los Angeles, in 1989, and most notably, the Turner Prize, United Kingdom, in 1986.